Located in the charming market town of Petersfield, Hampshire, Twirl Bridal offers an exquisite collection of vintage inspired long and tea length bridal gowns. We also offer dresses for maids, prom girls and other special events. We are just a two minute walk from Petersfield train station, making us extremely accessible by car or public transport. We specialise in vintage inspired wedding dresses by LouLou Bridal, Louise Bentley, Lois Wild and Rita Mae . Many can be customised and you can also try on some of our lovely accessories to match. We stock sizes 10 - 24 in the shop, but some gowns are available in 8-32. When you visit the shop, you will be welcomed with a refreshment, ready to enjoy a relaxed, friendly and fun appointment. A few of your friends and family are welcome to come with you, as their opinions will help to guide you through. Choose who knows you the best and who will enjoy the experience the most! Your appointment can last up to two hours, trying on our beautiful dresses with our undivided attention. Prom and evening wear appointments usually take about an hour. All you need to do to secure your appointment, is get in touch. We’d love to hear from you and we are here to answer any of your questions. 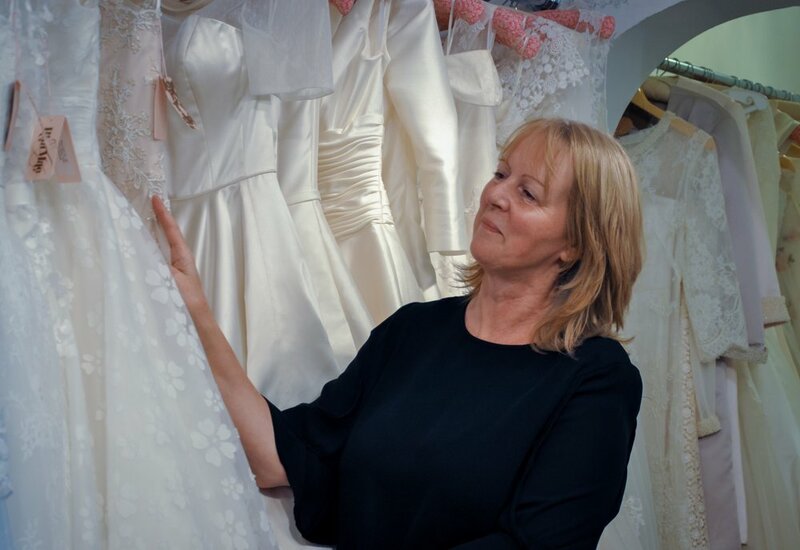 It is best to book your appointment at least 6 months ahead of your wedding, but such an important purchase is better planned early, maybe just after you have chosen the venue, then you can relax, in the knowledge that the dress will be ready in plenty of time. However, if there is a last-minute requirement, we have samples available to purchase and suppliers can offer rush cuts at an additional cost. We are always happy to offer help with your budget by giving discounts and package deals throughout the year. Our aim is to have happy brides, maids and prom girls, no matter their budget, who will feel simply amazing on their big day. I went looking for a wedding dress for my October 2016 wedding. A friend recommended Twirl Bridal Boutique to me and that’s where I bought it. It was so much nicer than the larger stores. A much more personal service and so relaxed. I thought on that day that it would be a happy job to do. I had been considering a change of direction for some time after working in the same job for 20 years. I started looking for businesses and a few months later I found out this lovely shop was up for sale! I could not wait to get on the phone to make enquiries and so, in July 2018, I bought the shop and took over as the new owner. It was easy to slip into my new role and I have already grown to love this shop and the people who visit! I have created a modern boutique feel but have kept a vintage style, to complement the gorgeous dresses. It is never difficult to be friendly with excited brides and a no pressure approach is how I always work. I hope that all of you who choose to visit enjoy your time as much as I enjoy meeting and helping you all. Book your appointment with Twirl to find your perfect dress or outfit! Booking is best, as we can get quite busy, but you can drop in anytime and we’ll do our best to help. Experience the fun of trying on beautiful dresses with our full attention and no interruptions. You become the focus of the day and can take your time finding the perfect dress and accessories to suit you. Feel free to bring a friend or two! Once your dress or outfit is ordered you can relax knowing that it’s in safe hands. We’ll contact you once it’s ready to collect and arrange a fitting. Alterations ladies are not far away, should we need them.